Join us in celebrating the Christmas season with the SLI Festival Of Trees. The SLI Festival of Trees is your chance to revel in the Christmas spirit with more than 70 decorated trees and wreaths. Not only will this be an amazing holiday spectacle for you and your family, but you can also feel good knowing the proceeds of the festival will help brighten the lives of Topekans with intellectual and developmental disabilities. 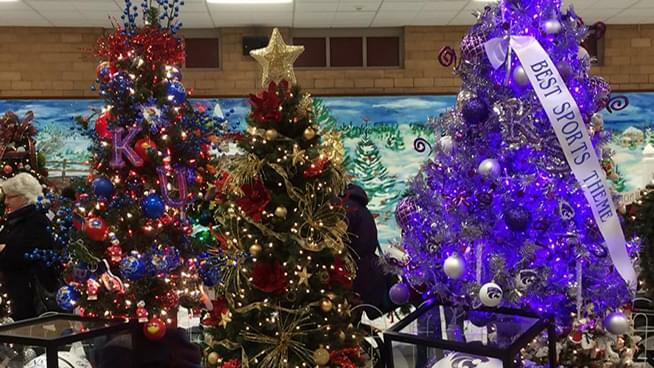 As you enter Ag Hall, you are greeted by beautifully decorated trees and wreaths by talented designers. During this event happening November 29th-December 2nd, there will be a pancake breakfast December 1st and photos with Santa the weekend of the event and there will be enchanting performances from local schools and groups. To top it off, our very own Majic Morning Show host Angie is the MC for the evening. To find out more about all the events happening, head to https://slitopeka.org/festival-of-trees/events. Tinsel & Treasures is the Ladies Night Out where you can kick off the holiday season with an evening of hors d-oeuvres, an open bar, entertainment, and a silent auction. Tickets are $40 and guests must be 21 years of age. Tickets can be purchased HERE. We will be there playing holiday music, giving out prizes, and encouraging participants to take a “holiday card” photo at our SLI Festival of Trees Photo Booth! And if you want to go to the SLI Festival of Trees, be listening every Tuesday during the Majic 107.7 Morning Show with Angie & Sean, as it is “Tinsel Tuesday”! During the 6,7,8 and 9 AM hours, be listening for the cue to call. Be the correct caller and win a 4 pack of tickets to the event.